These groups of artists, many of them men, live together and play music night and day. Easily identified by their patchwork clothes and the instruments they carry, they live as outsiders, rejecting social hierarchies in favor of a collective mindset. Tagore’s praise of Bauls and his adoption of their themes in his work enhanced their reputation, because in spite of being regarded as saintly musician-mystics, they nonetheless had a low status and lived on the fringes of society. Fortunately, today in West Bengal and Bangladesh, Bauls are becoming more respected by many people for their way of life, their spirituality and their music, and are often seen as representing ideals for a more equal and just society. Baul music’s higher profile has put in onstage at the World Sacred Music Festival, the Morocco-based event that now has touring offshoots around the world, and the Fireflies Festival of Sacred Music in Bangalore, Bangladesh. 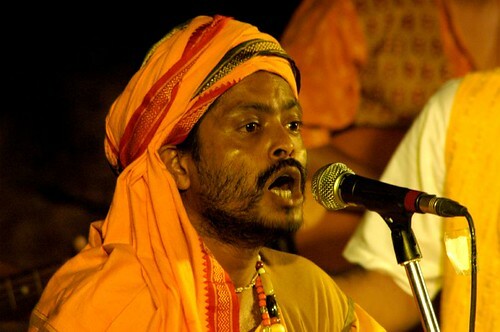 Singer Kartick Das Baul (pictured), one of the form’s better-known exponents, has even sung in many Bengali films and has performed with the Kolkata-based jazz band Just Us at Fireflies, according to the Indian arts and entertainment website Buzz18.com. Kartick Das Baul’s main gig, though, is with the Baul folk band Oikyotaan, which according to its website “aims at reaching a space where folk and contemporary music complement each other.” The band has made a film titled Notun Projonmer Baul (New Generation Baul) and hopes to establish a Baul foundation to promote and preserve Baul culture. Image by mdemon, licensed under Creative Commons.